UNITED NATIONS, March 14, updated March 15, 4 pm -- Now that UN envoy Martti Ahtisaari has said he can do no more to bring about an agreed-upon status resolution regarding Kosovo, on Wednesday Inner City Press asked Veton Surroi, the head of the Kosovo delegation to the Vienna Kosovo status talks, whether he thinks Russia will veto independence for Kosovo. Mr. Surroi said that he doesn't know, that he feels like a person standing in a barbershop speculating about which country will get into the World Cup. Only one person knows, he said: Vladimir Putin. Inner City Press also asked him about the municipal elections in Kosovo, which the UN delayed. Mr. Surroi called that unfortunate, saying with an allusion to Gerald Ford that he thinks that those in Kosovo could have walked and chewed gum at the same time. Mr. Surroi predicted that there will one day be Kosovar troops in a Balkan peacekeeping brigade "in Central Asia or wherever they're needed." One place peacekeepers are apparently still needed is Eastern Congo, specifically North Kivu, where now 10,000 people have been displaced by fighting involving Rwandan ex-Interhamwe. Wednesday Inner City Press asked Ban Ki-moon's spokesperson what the UN's mission in the Congo, MONUC, headed by William Lacy Swing, is doing about this. They are still policing the area, the spokesperson assured. Inner City Press: On the Congo, there are reports now of 10,000 people displaced on the border of the Congo and Rwanda, and fighting. Is MONUC in the area? What�s MONUC�s position on 10,000 people displaced in eastern Congo? Spokesperson: We�ll try to get more for you from MONUC. And did you go to the website? Inner City Press: Yes. I did. But all they do is run a Reuters piece. But there�s no statement about whether MONUC is actually still policing eastern Congo or whether it�s trying to. Spokesperson: It is still policing eastern Congo. Yes, definitely. We'll see. The spokesperson also on Wednesday announced something long predicted, that Kofi Annan's humanitarian chief Jan Egeland would get a trouble-shooting gig under Ban Ki-moon. He is being (re-) named an Under-Secretary General, within the Department of Political Affairs. With B. Lynn Pascoe, that now makes two USGs in DPA, a department that some have suggested should be merged into DPKO. With new UN envoy Joaquim Chissano recently having met with indicted war criminal Joseph Kony, Jan Egeland will have to find other lions with which to try peace magic tricks. [Update of March 15, 4 pm -- DPA points out that "Jan Egeland's appointment as Special Adviser will have him working very closely with DPA and our Mediation Support Unit, however he is not 'in DPA.' 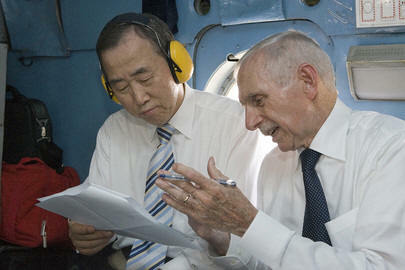 He is a Special Adviser to the Secretary-General and will not be based in New York. The only USG in DPA is the head of the Department, Mr. Pascoe." Spokesperson: "One of Mr. Egeland�s duties will be to coordinate a standby team of technical experts that can be called upon at short notice to assist envoys in peacemaking efforts around the globe. The standby team is currently being developed as an initiative of the recently created Mediation Support Capacity within DPA." Inner City Press: Michele, one more Darfur question. 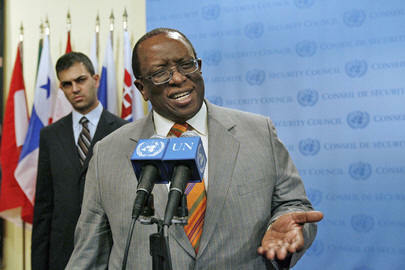 Sudan is trying to block the consideration of that human rights report by the Human Rights Council in Geneva. So I understand that�s in Geneva. But they�ve said it shouldn�t even be considered by the Human Rights Council because the Indonesian Ambassador had dropped out for various reasons. So, I�m wondering, does the Secretary-General believe that that report should be considered by the Human Rights Council, which is a major UN reform brought about recently? Should the Council consider that report or not? Spokesperson: It is a matter for the Human Rights Council. Some would say that for the report to be blocked from being considered is another blow to credibility. But who's counting? UNITED NATIONS, March 13 -- When is a text not a text? In the hallway outside the Security Council on Tuesday morning, referring to their negotiations to impose another round of sanctions on Iran for its nuclear program, diplomats from the Permanent Five members used different definitions of the T word. 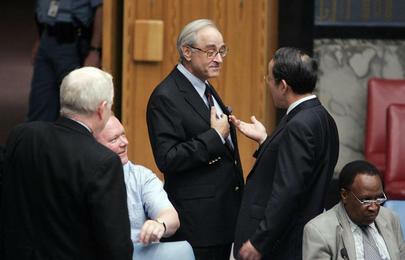 At 11 a.m., Ambassador Wang of China said that "there is a text, but there are some areas that need to be clarified." Thereafter, a French diplomat insisted that "we don't have agreement, so there is no text." One observer cast about for insight from French author Roland Barthes' 1973 tome, "The Pleasures of the Text," without satisfaction. Soon it was announced by this month's Council president, South African Ambassador Dumisani Kumalo, that the non-Permanent Ten have requested consultations on Iran on Wednesday afternoon, whether there is a P-5 agreed text then or not. There were other laughs on Wednesday, including just outside the Security Council. After her briefing on population trends, Hania Zlotnik was sitting to the side of the Council entrance, in what she called a drab area. Inner City Press asked about the admittedly grassroots but still-developing story of rodents and eels in the UN. Note to those who man the water-screening machines in the third sub-basement: Ms. Zlotnick said that she is a culinary fan of eels. Her briefing involved population growth and loss trends and projections to 2050. Inner City Press asked about the Russian Federation, where a one-quarter decline in population is projected. Ms. Zlotnick responded that while there is immigration into Russia from the former Russian republics of the Commonwealth of Independent States, these CIS States no longer have fast-growing populations. But perhaps no every place need more people, Ms. Zlotnick opined. To demonstrate two modes of population growth, Ms. Zlotnick brought differently-shaped pottery. Those who use Power Point as a crutch could have learned from this old school show-and-tell. Question: Two rule of law questions. In the news, there are protests in Pakistan of the President arresting or of taking the Chief Judge and putting him out. I'm wondering if the Secretariat or anyone in the UN system is monitoring it or has anything to say about it? Spokesperson: I'm sure the High Commissioner for Human Rights is following these issues. I don't have any statements on that. Question: Also, there seems to be a trend. In Uganda, yesterday you said you praised the LRA talks. There's quite an uproar about suspects in court being [re-arrested] by the military after having been found not guilty. So I'm wondering is there a Special Rapporteur who covers breakdowns and rule of law in court systems? Spokesperson: We have a High Commissioner for Human Rights. Her office follows all those issues. Question: Yesterday, you spoke about Zimbabwe, which is all to your credit, and so did she. So who decides when you speak and when only she speaks? Spokesperson: I think she's a very powerful voice. Agreed. Still, the mystery of speaking on one situation and not another, next door, remains to be explained. Inner City Press re-posed the questions to the spokeswoman for Ms. Arbour last time she was in New York, and will report any comment on this site. Inner City Press also re-posed questions previously sent to the UN Political Office on Somalia and has been told that Francois Lonseny Fall will be asked. Watch this site. UNITED NATIONS, March 12 -- At the UN on Monday, while the Security Council's Permanent Five members, and Germany, at least briefed the press after their closed-down meeting about Iran sanctions, elsewhere the UN was more untransparent than ever. In the basement, outside nearly every conference room was the notation "Closed Meeting." Most often this was on the flat screen TVs that cryptically say what is going on inside. 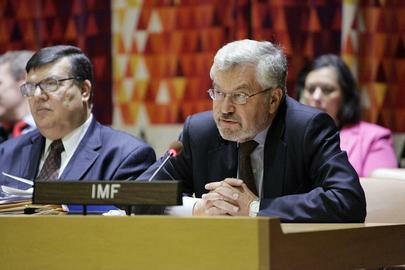 For example, G77 on internal justice, or, meeting on restructuring of DPKO (peacekeeping). But on Conference Room 4, where the flat screen didn't say anything about the Sixth (Legal) Committee's meeting on internal justice being closed, a handwritten sign was on the door: closed meeting. Why? "I will not go into specifics, since the best we can do is to keep the negotiations confidential. But I can say that we are now very close. It is the best meeting we had since the beginning of the negotiations. I hope that tomorrow morning we will be able to inform other members of the Council that we have a good text. It is important to have a good text, which shows a progressive approach. We want the Iranian government to understand that it has a choice to make and that it has to come back to negotiations." The process went "back to capital" overnight. U.S. Ambassador Wolff, whose capital is closest, was the least optimistic. 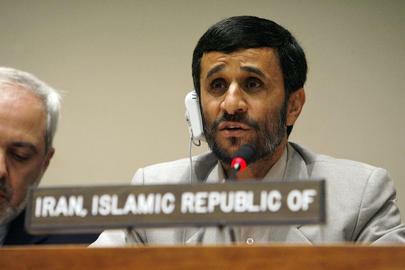 Meanwhile, Iranian president Mahmoud Ahmadinejad said he would address the Security Council in opposition of the proposed sanctions. As one wag put it, he better hurry. While Ban Ki-moon's spokesperson's noon briefing was full of questions about Sudanese president al Bashir (and Inner City Press asking first the spokesperson then UNDP about the just-begun audit of North Korea operations), Ban Ki-moon himself was meeting at noon with the permanent representative of Uganda. Did Ban bring up the Ugandan army's incursion into the court system? The unresolved killings by the army? This is not known.